Since its origin in the late 19th Century, Mission-style furniture has steadily grown in popularity. And it currently enjoys a high degree of favorability among Amish cabinetmakers. Indeed, simplicity and strength make the Mission style one-of-a-kind. Notice its wood corbels and rustic Mission hardware. So what happens when you build a line of office furniture in the Mission style? You get Mission Office Furniture: Strength and Beauty Meet. The classic Mission L-Desk boasts wood corbels and a sleek finish. Mission office furniture represents an elegant, yet practical lineup of classic office furniture. 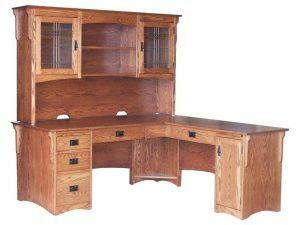 And these features come alive in the Classic Mission L-Desk from Brandenberry Amish Furniture. The Mission L-Desk, pictured here, features wood corbels andblack Mission hardware. As well as plenty of dynamic storage space and a huge variety of custom options. Plus, leaded glass doors and a gently curved base add a touch of elegance to this stunning desk. To see more Mission office furniture, visit Brandenberry Amish Furniture. And see for yourself what’s so great about Amish-crafted furniture.